The movable secondary mirror on the Large Binocular Telescope during its installation in the Arcetri lab. The image shows the 672 tiny magnets spread over the back of the mirror. The reflecting face of the mirror is face down. The upper portion contains the electro-mechanical devices that control the magnets. A telescope in Arizona has taken the sharpest pictures yetof deep space from Earth with a new system that provides a level of claritynever seen before. The technology relies on adaptiveoptics ? a mechanism that allows a telescope's mirror to bend in order tocompensate for the blurring of light as it passes through the Earth'satmosphere. The new system, installed on the $120 million LargeBinocular Telescope (LBT) on Mount Graham in Arizona, has delivered images threetimes sharper than the Hubble Space Telescope, LBT scientists said. And that'swith only one of its twin 27.6-foot (8.4-meter) mirrors working. "The results on the first night were so extraordinarythat we thought it might be a fluke, but every night since then the adaptive opticshave continued to exceed all expectations," said astronomer SimoneEsposito, leader of a team from Italy?s Arcetri Observatory of the Istituto Nazionaledi Astrofisica (INAF). "These results were achieved using only one ofLBT?s mirrors. Imagine the potential when we have adaptive optics on both ofLBT?s giant eyes." INAF collaborated with the University of Arizona?s StewardObservatory to build the adaptive optics device, called the First LightAdaptive Optics system (FLAO). The Hubble Space Telescope has achieved groundbreakingimages thanks to its perch above Earth's atmosphere. It and other spacetelescopes also have another advantage over ground-based observatories: Theycan focus on one celestial object for hours or even days, steadily collectinglight to form a brighter image. Bad weather can often interrupt observing sessions fromEarth, and even under perfectly clear conditions, a ground-based optical telescopescanning the night sky must stop observing when the sun rises. Yet the Hubble telescopeitself ? with a main mirror 7.9 feet (2.4 meters) wide ? is somewhat smallcompared to the largest ground-based observatories. However, those Earth-boundtelescopes are hampered by the atmosphere, which blurs light passing throughmuch the way water blurs the view from the bottom of a swimming pool. That's where adaptive optics come in. The LBT has a 3-foot (0.91-meter) wide secondary mirrorbuilt in. This mirror, only 0.06 inches (1.6 millimeters) thick, is so pliablethat it can easily be bent by devices pushing on the 672 tiny magnets glued to itsback. A special sensor detects atmospheric distortions in realtime and controls the mirror to adjust its position to compensate, effectivelycanceling out the blurring. The mirror can make adjustments every one-thousandthof a second, with accuracy to better than ten nanometers (a nanometer is onemillionth the size of a millimeter). Astronomers measure image sharpness with a term called theStrehl ratio, where 100 percent would be a perfect image. Without adaptiveoptics, most ground-based observatories have a Strehl ratio of less than 1percent. With the new system, the LBT has achieved peak Strehl ratiosof 82 to 84 percent. "This is an incredibly exciting time as this newadaptive optics system allows us to achieve our potential as the world?s mostpowerful optical telescope," said Richard Green, director of the LBT. 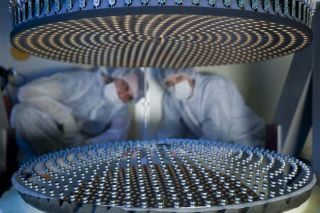 "The successful results show that the next generation of astronomy hasarrived, while providing a glimpse of the awesome potential the LBT will becapable of for years to come."